The Namibia Airports Company (NAC) was on 25 February 2019 awarded the PMR. 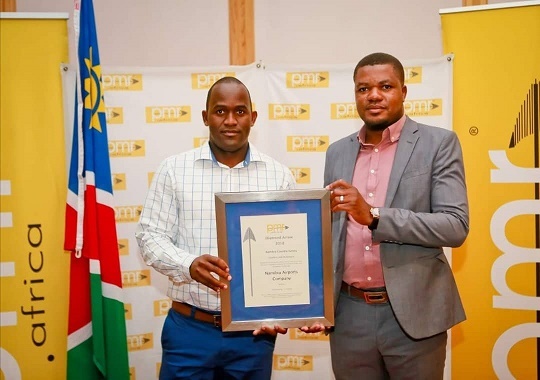 Africa Diamond Arrow Award in the top category of Outstanding, 1st Overall for Excellence in the Transport Sector in Namibia over the last year, for having done enough in the past 12 months to stimulate the economic growth and development of Namibia. PMR. Africa revealed that the Namibia country survey for 2018 ha been derived from ratings by a random, national sample of 160 respondents comprising of CEO’s, MDs, business owners, company directors and managers and senior government officials based in Namibia. “We are pleased to be recipients of this prestigious award in recognition of our consistent and invariably progressive concerted efforts aimed at operating safe and secure airports, coupled with enhanced passenger facilitation not dissimilar to the threshold set by international airport operators of reputable note. The PMR awards are indicators of a company, department or institution’s competencies and they are further a culmination of a research process, whereby companies and institutions are rated based on respondents’ perceptions with a strong focus on evaluating and measuring customer service and customer satisfaction.